I started Cindy Pon's Silver Phoenix after the bash was already going. But it was SO AMAZING that I knew there was no way I could let this bash go by without featuring Cindy. So here she is! Not only did Cindy provide awesome interview answers, Megan (owner of Braun Books bookstore and the one who recommended Cindy's books to me) has donated a kaboodle of prizes for a giveaway! So read the interview, then enter to win! Now, except for my experience playing “Age of Empires: Asian Dynasties” (and I know that totally doesn’t count) I’m a complete ignoramus when it comes to Asian culture. One of the things I was really curious about in the books were the names of the characters. Some characters had one-part names, some had two, and some had three! Is there any meaning to how many names there are? And do you have to do extra research to create these names (more than someone who makes up random European-sounding names, I mean)? I’m specifically curious about Li Rong And Silver Phoenix. Because wasn’t his family name Li? So is he Li Li Rong? And why does Silver Phoenix have a name that seems more like a title? You said in your interview at Tu books, and at the end of Fury of the Phoenix that the mythology in the book is primarily from your imagination. But surely to create such intricate culture and mythology you must have some favorite stories that already exist, right? What are some of your favorite historical/mythological stories? I did research and used a really ancient text to help inspire for creatures and worlds in Silver Phoenix and Fury of the Phoenix. The serpent demon is part of common Chinese folklore and the book I read spoke of a Land of One-Armed tribe, Land of Women, etc, that I incorporated into my stories. As a child, I grew up on Greek and Roman mythology and loved reading them a lot. I have been a student of Chinese brush painting for eleven years now. It is similar to western watercolor but also different in strokes, history, subject matter and aesthetics. I have no background in oil or acrylic painting but from what I understand they are a more forgiving medium--as in you can go back and cover up or work over mistakes. In Chinese brush painting, this is usually impossible. If you do something wrong, you have to start over. Did anything about how the first book was received by readers influence what happened in the second book? Honestly, no. I write for myself and it's most important to me that I stay true to the characters and my story. I know some readers [SPOILER] were upset by how things ended between Ai Ling and Chen Yong in Silver Phoenix. But I felt it was true to the characters and where they were at the time. Would you like there to be more books in the Phoenix series? If you did write something else, do you think you’d continue to write Asian-inspired fantasy, or do you have other genres that you’d like to try? Ai Ling's story is finished. But yes, I have written another book in the same world (Kingdom of Xia) with new characters. This one (which I'm hoping to sell) stars a heroine that is a shape shifting serpent demon (similar to the one that Li Rong had "an exchange" with, ha!) and features a strong female friendship. If you had to step into the world of the Phoenix books, take the place of one character and live out their entire life, which would you choose and why? I would have to say Zhong Ye. He is not a good character but he's complex and he goes through a lot in my books. Also, as bad as it is, I can't help but wonder what it's like to feel almost immortal. I think life is too short and much of that comes through in what I write. The game continued on for some rounds. Peng hollered a sea ditty for the crew, Loa Lu juggled three teapots, and Yen crawled a mochi about the Moon Goddess, surprising Ai Ling with the pristine tenor of his voice. Fuzzy clouds gathered, and the night deepened. The crew’s damp teasing faded into the distance. Ai Ling licked her ankle. A hardcover set of both Silver Phoenix and Fury of the Phoenix! Enter to win using the rafflecopter! Open to US only. Well, I am willing to give her books a go. Sounds very fascinating. I had never heard of her books before now. Being a HUGE fan of Asian culture, I'm really excited about these!!! Ooh, this book look really good. Thanks for the review and giveaway! I've always been fascinated with Chinese Brush painting. It's utterly terrifying to think that any mistake can send you to starting over. GAH! Great interview. I love Cindy's books! Strong female main character, lush descriptions, action-packed storyline, hunky love interest... what's not to love? aww thanks so much, liz! I keep seeing the first book on the shelf at the library, but I've never picked it up. It sounds really interesting, though. Onto the to read pile it goes. I'm glad that all of the books are out, though. I can't handle waiting for new books anymore! 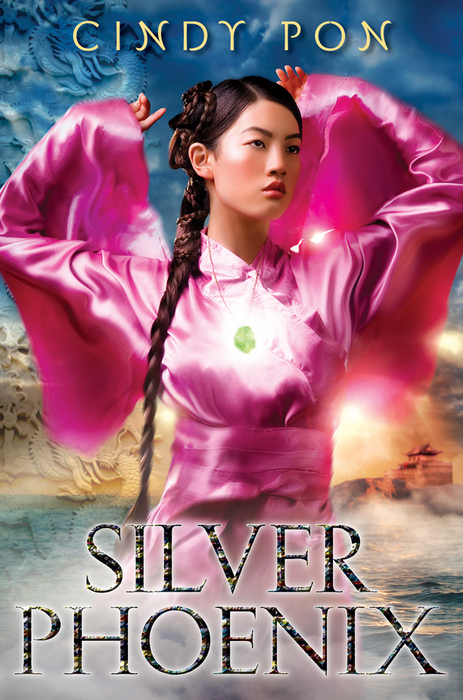 Just finished reading Silver Phoenix to get ready for Cindy's visit to my library at the end of the month! I, too, was so curious about the names in the story so it was very interesting to read that. Can't wait to read the conclusion in Fury of the Phoenix. May I just sit and stare at the cover for a bit longer? That pink dress is mesmerizing. I love Cindy! Thanks s much for the interview and giveaway! This is the first I've heard of your books, but they sound amazing. I am definitely going add them to my to-read list. 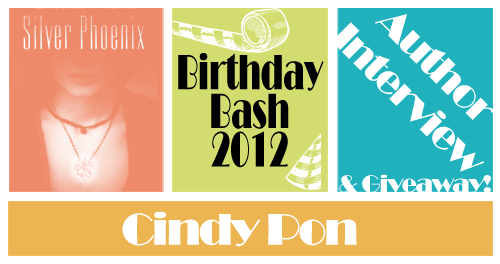 I love these books and I love Cindy Pon! Great interview! Great interview. Thanks for the giveaway! I would love to be able to paint. Oh wow! That's really cool! I really need to read this series.